Lori Phillips in Nashville Opera's 2006 production of Turandot. A couple days ago, we started to look at “In questa reggia," the great entrance aria in which the murderous Princess Turandot, star of our next opera, explains the origins of her vendetta against men. Today we hear from Lori Phillips, the wonderful soprano who will be taking on this role at Seattle Opera this summer (along with former Seattle Opera Young Artist Marcy Stonikas, who sings Turandot on August 5). Lori made her Seattle Opera debut 10 years ago, in the role of Amelia in Un ballo in maschera. Her twin sister Mary, a mezzo, has also sung at Seattle Opera several times. (Alas, they haven't yet sung Fiordiligi and Dorabella together for us!) Lori has previously performed the role of Turandot in cities including New York, Atlanta, Portland, Nashville, Birmingham, and Ottawa. You can hear a recording of her singing "In questa reggia" at her website. Why is this aria an important moment for your character? Turandot tells Calaf that thousands of years ago, in this kingdom (the same one she is reigning over), her ancestor, Princess Lou-Ling, cried out—and that cry has taken refuge in Turandot's soul. Lou-Ling was raped and conquered by a man seeking power. If this aria were the only thing an audience member knew about Turandot, what might they think? I hope that they'd think she has good reason for what she is doing, acting in this intense self-protective way. They may also think that she is possesed by the spirit of her ancestor. Does Turandot always explain herself this way, each time a prince undertakes her riddle test? Yes, I think that Turandot explains herself this way each time and furthermore, that she is disappointed each time the suitor chooses to ignore her story. Which emotions does Turandot feel when she sings this aria? Turandot appears to be strong and confident but she is really experiencing intense fear and deep sadness. Does your character change over the course of this scene? Does your voice have to change as she changes? When Calaf talks back to Turandot, which I play as happening for the very first time, she begins to feel something for him--he is different than all the others who have come before. Certainly, later in the story,she tells Calaf that from the very first moment she saw him she loved him. Puccini writes in such a way that helps the voice change in color to reflect this. Is Calaf intimidated by your aria? No, Calaf is not intimidated. This is what makes him special. How could Calaf back down, at the end of the aria, when you suggest he give up? You tell him, “Straniero, non tentar la fortuna” (Foreigner, do not tempt fate! )...but can you really imagine him just walking away? I don't believe that Calaf can back down at that moment. He must remain strong. But he does "back down" in Act 3 when he tells Turandot his real name and therefore proves his true love for Turandot. If you could advise an operagoer to listen for one thing during this aria, what would that one thing be? Try to listen to the regal quality of it—the beautiful serenity at the beginning which builds to a more intense, declamatory conclusion. What’s the most challenging aspect of this aria? The tessitura and the breath support needed to maintain the serenity. 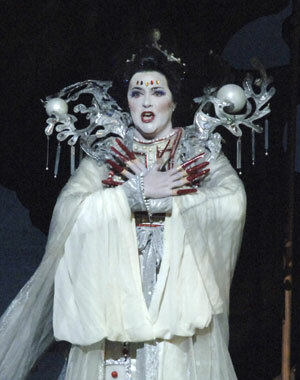 Are we supposed to sympathize with Turandot or are we supposed to be scared of her? I like the audience to sympathize with Turandot. This is difficult, however, because of everything that has been said about her before she appears, and also because the story has a very sympathetic character in the other soprano role of Liù. But I've heard that people have been able to sympathize with my interpretation of Turandot! Why do you love this aria? I love the way Puccini built "In questa reggia.” He starts it securely, serenely, with consistent, lyrical lines and leads the soprano into intense leaps (middle C#'s to high A's) in the middle and through to the end of the aria, culminating in a dueling high C with Calaf.